#askjustin On a scale of one to 10, how much do you love glitter, I love glitter an ELEVEN. When I first saw the promo, and even now when I look it at, I mostly feel confused. I don’t get the “unplugged” angle (he’s a politician, not a musician). And speaking of insane … what in Helvetica is up with that font? I am 100% sincere when I say that that font is partially responsible for my decision not to attend, as is the fact that I have my own unplugged (a cappella) rehearsal to attend. 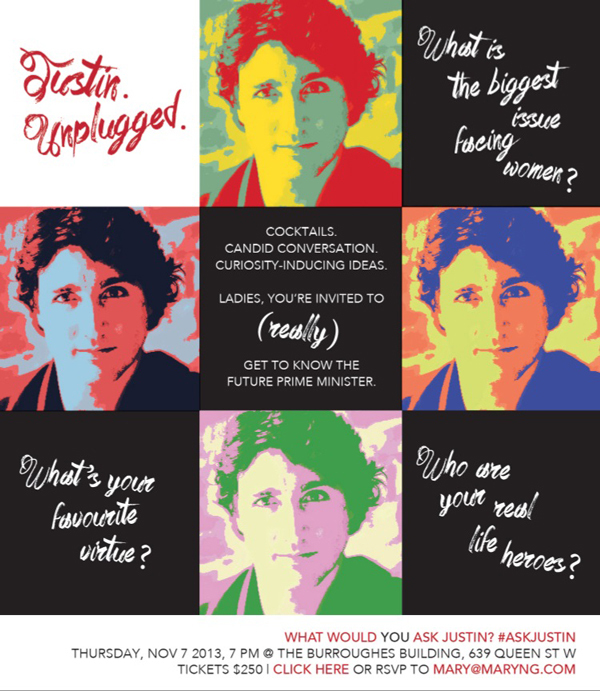 Unlike many of the #askjustin Tweeters last night, I didn’t find the graphic offensive. I did find it trivializing. The issues facing women — to the extent that there are gender-specific concerns not directly related to our unique physiology — are legitimate, and deserve to be treated respectfully and seriously. I have no doubt that’s exactly what will happen at the actual event. Still, I don’t understand why the organizers felt this was the best way to get those women in the door. The answer likely lies in that visceral reaction I had when I first saw the invitation. As I said, the reaction was an instant and complete sense that this event was not for me. It’s not the $250 price of admission — fundraisers often have big-ticket prices. No surprise there. It’s more that I looked at the address — trendy Queen West — and knew that that $250 would escalate to $500 or more because I have nothing to wear. Not one thing. I’m a work-at-home-mom. My wardrobe is 50% jeans and 50% yoga pants so old that their sheerness is due to overuse, not recent changes in textile inputs. In other words, the event felt exclusive — in the sense that I felt excluded, from this singular event. That is not my experience of the Liberal party as a whole, nor its leadership, its advisors, its members and hordes of volunteers. I’m not bailing on anyone or anything over this. I rather resent the implication that I should. Reconsider the concept. That is, the utility/effectiveness of gender-focused events. We’re more than half the population. Our issues are your issues: full stop. On a practical note, day-to-day, I have more in common with a harried dad than I do fabulous single girls. Our bonding points are childcare costs and aging parents and the goddamn miracle it is that any relationships survive having children. Not nail polish (as Tweeters suggested) or virtues (as the invitation did). Find five serious questions you can answer. Find them on Twitter and answer them there. Won’t take more than 10 minutes of sifting through the #askjustin posts to find the genuine queries about barriers to income equality, the lack of affordable childcare, the problem of mounting student debt, the dearth of women in boardrooms and backrooms. Not everyone can afford to attend and ask in person. Don’t let that limit your outreach, now that so many more are paying attention. Ignore the rest. I haven’t checked the #askjustin threads this morning. I suspect event organizers are doing just that, as it’s the smart and reasonable thing to do. UPDATE: And as of just-before-8:00-AM, that is, hours before I sat down to write this, #2 was taken on in full. Not just five, but about two hours of answering questions. Nicely done.